During our inspection of Villa Windu Sari we were treated to great service and cuisine by the staff. The villa is modern, functional, practical and most importantly comfortable. We felt very at home here. Our visit was with a group of friends and we found Windu Sari well laid out and generous enough for us to be able to enjoy each other’s company or retreat for some privacy and solitude when we wished. The villa would also work well for families. Settling into the embrace of stylish Villa Yaringa, with little to do but gaze across the endless sea and sky, we soon felt like cosseted celebrities hiding away from the world. We were really taken with the villa’s terrace and gardens, which are arranged in different sections and levels like a giant-sized chessboard undulating towards the sea. The sunken lounge in the middle of the terrace is a fine spot to gather for sundowners, and we also loved relaxing in the shade of the trees on the “island” that rises in the middle of the pool. 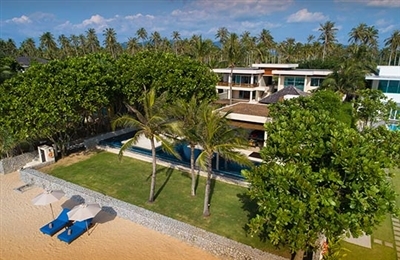 The views – an unblemished panorama of sea, sand and sky – are simply breathtaking. Our family had a quiet visit to Yaringa, but having seen the wonderful pool, outdoor entertaining areas and sea views, we felt it would be a great place to host a party; mingling poolside with cocktails under the tropical night sky. Weddings and events of up to 40 people may be hosted here (an event fee applies). Initially, The Ylang Ylang can come across as quite daunting, especially the atrium, but it doesn't take long to settle in and feel comfortably at home. The staff are incredibly welcoming and gracious; some of them have been working here for nine years. The black and gold theme will not be to everyone’s taste – it is a bit glitzy – and we never did figure out what the blue lighting under the beds was all about! Given its seafront location and the salt water environment maintenance is a continual battle and, in places, the villa is definitely showing its age. Some fittings may not work and some of the huge doors maybe stiff – it shouldn’t affect your enjoyment of Villa Ylang Ylang though, and staff are on hand if you need help with anything. Some of the bathrooms feel a little dated but they function just fine.